THE WRITING BUDDHA - Opinions | Books | Movies: From Where I See by Ajay Yadav (Book review-3.5*/5) !!! 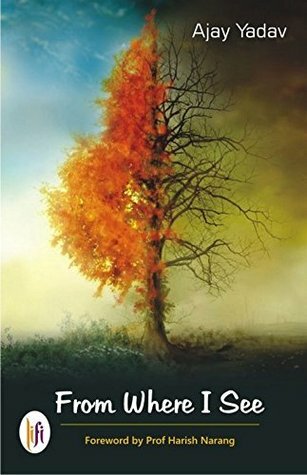 From Where I See by Ajay Yadav (Book review-3.5*/5) !!! I woke up last night completing my 38th book of 2015:- "From Where I See" written by the debutante, Mr. Ajay Yadav. The cover page of the book and the title itself confirms that it's about seeing the same thing two different perspective. After reading the foreword and author's note in the starting, it was clear that author is going to put forward his point of view. It needs a lot of guts to write a controversial and debatable book like this which picks up some topics that people don't really believe in writing until and unless they aren't a celebrity reporter with lots of support. Mr. Ajay Yadav should be complimented for speaking about diverse topics and allowing his readers to gain some knowledge out of this reading experience. For once it seemed as if I am reading few of those historical books which discusses about truth that are never discussed in their original forms. Ajay Yadav's writing is very simple in spite of topic that he chose to write upon. He wanted people to look at the world from a perspective from which he looks and therefore, he kept everything easy for readers to grasp this book. Generally, when authors attempt such stuffs, they make it enough complicated that only people with great English prefer picking it up. But this book is written for all. Anyone from age 10 to 80 can read it. That's the specialty of the book. The research author have undergone to come up with this book is easily visible in each sentence that he have written. Few sentences are cheesier when the conversation between the protagonist and Shurti takes place. That's when I felt that author should have got the book edited and made few sentences crispier. From Where I See discusses different parameters on each topic that author feels is the need to discuss in current society norms. The best effort can be seen in the topic of religion, India's and world's history and the blind following for certain leaders despite knowing their real truth. Some facts are really surprising and you will be blank after reading them. Initially, the point of views of author looked immature but as the book grows upon you, you start seeing things with an open mind without judging the author. Few points are definitely debatable and that's where the author wins. His purpose of making people debate regarding these topics becomes successful. Coming to the drawbacks of this book:- Book's back cover calls it a Fiction/Religious genre. I felt it's misleading. It's more non-fiction than fiction. The reader who must have picked it up considering fiction would have felt cheated. The suspense initially is interesting but in the end the way it ends isn't something for which author should have presented it in the form of thriller. He should have gone the non-fictional way and represented his thoughts in the form of chapters. As I said above, I found some sentences cheesier at times when the characters were talking with each other. But in the end, I would say that I liked reading some great facts mentioned by the author. I got to know what my history books and newspapers never discussed. Author have written his philosophies and conclusion in italic font which is good as whenever you want to go through the main points of the book, you can directly read the italics and skip the rest of the things. I give the book 3.5* out of 5. It could have been easily 4* if it was a non-fictional book. And thanks to Mr. Ajay Yadav for the knowledge.